The M.Zuiko Digital ED 75mm f1.8 is a premium lens recently introduced in May 2012 by Olympus for the micro 4/3 camera mount. Olympus characterize it as a “ high-Grade Portrait Lens (150mm equivalent), a high-speed, single-focal-length telephoto lens that is optimized for studio, stage, indoor sports and portrait photography” and it is priced accordingly at $899. Though quite small and light by conventional 35mm standards, the M.Zuiko Digital ED 75mm f1.8 isn’t a particularly small or lightweight lens. The front element is large (58mm filter) and the barrel is constructed of metal rather then the more commonly seen plastic. It weighs 10.76oz (305g) and it measures 2.52" in diameter and 2.72" in length (6.40 × 6.91 cm). It looks and feels like a high quality lens from the days of mechanical cameras – except that there’s no aperture ring and the focusing ring has an exceptionally light and smooth feel. In part this is presumably due to the fact that the lens has an electronic focusing system, meaning that the focusing ring isn’t mechanically coupled to the lens focusing mechanism at all. Turning the focusing ring sends a signal to the focusing motors which then do all the mechanical work. It’s a “focus by wire” system. The M.Zuiko Digital ED 75mm f1.8 has 10 lens elements in nine groups, including three ED (Extra-low Dispersion) elements to minimize aberrations. A 9 blade diaphragm is used to create an almost circular iris when the lens is stopped down. Since Olympus use a an in-body sensor shift stabilization system, the 75/1.8 has no internal optical stabilization. The “2x multiplier” of the four-thirds sensor gives the lens a similar angle of view to that obtained with a 150mm lens on a full frame camera. The lens uses an MSC (Movie and Still Compatible) AF mechanism which provides fast and silent focusing via the movement of internal elements. There is no focusing distance scale and hence no DOF scale or infrared focusing mark. Surprisingly for a relatively expensive premium lens, Olympus do not supply a lens hood with the M.Zuiko Digital ED 75mm f1.8, though one will be available (model LH-61F ). The cylindrical hood mounts externally and uses a friction thumbscrew to secure it on the lens. The price of the hood is $74.95 which seems a tad expensive, but then again I believe it’s made of metal rather than plastic (not that that makes it a better lens hood…). A premium hood for a premium lens (at a premium price). The Olympus M.Zuiko Digital ED 75mm f1.8 feels like a high quality product. The manual focusing action is very smooth and requires a very light touch. It might even be slightly under—damped for some people. The lens feels substantial and is obviously built with precision. As mentioned earlier, the 75/1.8 uses an electrical “focus by wire” system. Looking like a quality product and performing like a quality product aren’t linked of course, so just how good is this lens? The answer is very good indeed. There’s really very little to complain about in terms of performance. Focus was fast, silent and accurate. There’s no AF/MF switch on this lens. Manual focus and full time manual focus override options can be selected from camera menus. Distortion is essentially zero. Maybe there is some but I couldn’t see it and I looked quite closely. For all intents and purposes there is no distortion. Vignetting, even wide open at f1.8 is barely detectable. Maybe 1/3 of a stop in the extreme corners. It would be very unlikely that vignetting would be an issue and if it was stopping down to f2.8 would totally eliminate any worries. The vignetting pattern was slightly de-centered as shown in the test image at the end of this review. Again not something I’d unduly fret about. Similarly chromatic aberration is very well controlled. Even looking in the corners of the image at 100% magnification it’s very hard to see any trace of chromatic aberration. So how sharp is it? Very sharp indeed. Probably sharper than the sensor of the camera I was testing it on (olympus_pen_e-p3) can resolve. Not only that, but for all practical purposes it’s just as sharp wide open as it is stopped down and it’s almost as sharp in the corners as it is in the center! I don’t think I’ve seen better performance from a lens, certainly not one priced under $1000. Some of the Canon super-telephotos are this good, but they’re not f1.8 and they’re prices over $5000. There are some sample images and crops from the 75/1.8 at the end of this review. Bokeh. Well, you could say that “Bokeh is in the eye of the beholder”. Bokeh is the quality of the out of focus blur and very much a subjective judgement. However the M.Zuiko Digital ED 75mm f1.8 seems to produce smoothly blurred out of focus regions. During testing I didn’t see anything objectionable with the lens either wide open or stopped down. Is it the best Bokeh I’ve ever seen? I don’t know since I’m not a Bokeh connoisseur but I’ve included some example images for you to judge for yourself by. Why so good? Well, the Olympus designers did a good job – and the lens only has to cover an area 1/4 the size of a full 35mm frame which made their job a little easier. At $899 it’s not an inexpensive lens, so it was probably designed to a specification rather than designed to a price. The Olympus M.Zuiko Digital ED 75mm f1.8 is pretty close to being as good as it could be (and as good as it needs to be) – and that’s not something I say very often. If it was any better you’d might need a better sensor than is found in any current M4/3 camera to take full advantage of any improvement. So does it have any faults at all? There is perhaps a question of whether a 75mm lens on M4/3 is the best choice of focal length for a portrait lens. It corresponds to a 150mm lens on a full frame camera in terms of angle of view and though it’s an f1,8 lens and requires the exposure you’d expect for an f1.8 lens, it has approximately the same depth of field that a 150mm f3.6 lens would on full frame 35mm. So in terms of background blur (a desirable quality in a portrait lens), a 135mm f2 lens on full frame 35mm will give you more background blur than a 75mm f1.8 lens does on M4/3. Of course the M4/3 system will be much smaller and lighter than the full frame DSLR. Another “nit-pick” is the minimum focusing distance of 33" gives a magnification of 0.1x which isn’t exactly “macro”, but then again it’s not designed to be, or market as, a macro lens. I’m sure there might be some who could say the lens lacks “character” as a portrait lens, where “character” is defined by all sorts of aberrations that many fast lenses show when shot wide open. This lens doesn’t have any such aberrations and so produces a technically accurate and very sharp image. Since you can make a sharp image soft but you can’t make a soft image sharp, I wouldn’t call this an issue, though some might. Certainly as a fast low light lens for indoor sports and stage and theater work, sharpness is a virtue nobody is likely to complain about! A final point is that the 75/1.8 has no special weather sealing. In a lens aimed at portrait and indoor shooters, this isn’t of much concern, but if might be if you wanted to use it outdoors with a weather sealed micro 4/3 camera like the Olympus OM-D E-M5. 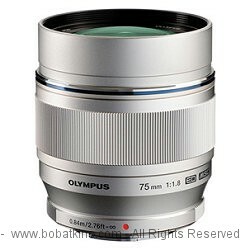 For those who shoot with the micro 4/3 system and want a high quality, fast, prime lens, the olympus_75/1.8 fits the bill. I doubt you’ll find a technically better lens than this one and if 75mm is your focal length of choice, you’re in luck! Possibly the Zuiko Digital ED 35-100mm f2.0 might come close, but I’ve never had the chance to test one and at $2499 it’s a lot larger, heavier and much more expensive (and 1/3 stop slower) than the 75mm f1.8. A lower cost alternative is the olympus_45/1.8. Though it looks similar to the 75/1.8 and it appears it might have a metal barrel, in fact it’s plastic, so those looking for superior build quality may be disappointed. However performance is pretty good (if perhaps not quite up to the standard of the 75/1.8) and 45mm (equiv to 90mm in full frame terms) is closer to a traditional portrait lens. It’s also less than 1/2 the price of the 75/1.8 at around $400. olympus_75/1.8. From the Olympus website: A high-grade fast aperture portrait lens featuring metallic construction and a light weight of just 10.7 oz. With a 35mm equivalent focal length of 150mm, it is suitable for studio portraits, theatre stage and indoor sports photography. A large bright 50mm front lens element compliments a sophisticated optical design of 10 individual lens elements in 9 groups, including a total of 3 ED lenses and 2 HR lenses. 16058215 Here are two rather boring crops from a shot of a railway timetable taken with the 75mm f1.8 at f1.8 using an Olympus Pen E-P3. The crop on the right is from close to the center of the image and the crop on the right is from the corner of the image. You can see the corner crop is very close in sharpness to that from the center, plus there’s no hint of chromatic aberration or distortion. 16058372 This is a shot taken at f2.8. It shows the lack of distortion as well as the center to edge sharpness, the absence of chromatic aberration and no visible vignetting. 16070733 This shot was taken after sunset using the Olympus 75mm f1.8 lens set to f1.8. Shutter speed was 1/40s and ISO was set to 1600. The wide aperture of the lens, along with the in body stabilization of the E-P3, allowed the camera to be used handheld without pushing the ISO so high that noise became objectionable. The 58mm Screw-In Metal Telephoto Lens Hood #960, by B+W is a screw-on lens hood that works well for the Olympus 75mm micro four-thirds lens. Compared to a snap-on hood, it takes an extra 20 seconds to have it ready, but the advantages are that it can be used with a polarizer, as the whole hood rotates the outer ring of the polarizer, and secondly, the hood will not fall off. It also costs about 1/2 of what the Olympus hood costs. I think the black hood looks pretty good with a black and silver body and silver lens. Alternative lens hood by B+W! A nice review of my current favorite lens. However, I'm confused by "the lens only has to cover an area 1/4 the size of a full 35mm frame." Shouldn't that be 1/2 the size of full frame?